Last week my daughter's godmother gave her the picture book Z Is for Moose by Kelly Bingham, illustrated by Paul O. Zelinsky. Moose is so excited about being in this book! He can hardly wait. With each page we see his patience dwindle. Finally, we arrive at the letter M, and it's not what we -- or Moose -- expected. Things go downhill quickly, until Zebra steps in and makes everything okay. 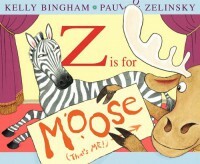 Z Is for Moose may be geared for ages 4 to 8, but it's also a lot of fun for the adult reading it!